[Episcopal News Service] Women and girls in remote, rural pockets of the world will stand in the forefront of the minds of Episcopal delegates heading to a two-week session at the United Nations in one of the most populous cities in the United States — New York. The 62nd United Nations Commission on the Status of Women (UNCSW) is taking place March 12-23. For 2018, the theme zeroes in on the challenges and opportunities in achieving gender equality and the empowerment of rural women and girls. “This is the second-largest UN event in New York City every year. It’s all very dramatic and exciting,” Lynnaia Main, Episcopal Church representative to the United Nations, told Episcopal News Service. The largest event is the United Nations General Assembly, held in September. Why rural women and girls? Virtually every gender and development indicator with available data reveals that, globally, rural women fare worse than rural men and urban women, according to U.N. Secretary-General António Guterres’ report for the 62nd commission, based on a 2016 study by the Food and Agriculture Organization of the United Nations. “Achieving gender equality and the empowerment of all women and girls in rural areas around the globe is clearly linked to all other goals and targets, including ending poverty in all its forms, eradicating hunger, achieving food security, improving nutrition and promoting sustainable agriculture, achieving full and productive employment and decent work for all and taking action to combat climate change,” Guterres wrote. Studies have long shown how inequality between women and men creates a domino effect of suffering for everyone worldwide, and the inherent challenges of rural life only compound the problem. For instance, just 39 percent of rural girls attend secondary school, while every additional year of primary school increases girls’ eventual wages by 10 to 20 percent, a global UNCSW report shows. More education also encourages them to marry later and have fewer children, and leaves them less vulnerable to violence. Of the many solutions that Sadiya Butros Tia Dent would like to bring back home to Sudan, the first would be practical ways to improve the education and training of girls and women. Tia Dent was selected by the first archbishop and primate of the Province of the Episcopal Church of Sudan, Ezekiel Kondo, to represent the new Anglican province created in 2017 at UNCSW. She wants to establish a center for internet technology, but also for basic reading and writing skills. Tia Dent spoke to ENS soon after she arrived to the Episcopal Church Office in Manhattan to rest and meet others before the two-week session. “Especially in a country like Sudan, they don’t even know their rights. To know, we need to be equipped,” said Tia Dent, who has a master’s degree in human rights. Also, on average, women comprise about 43 percent of the agricultural labor force in developing countries, and if these women had the same access to resources as men do, they could increase yields on their farms by 20 to 30 percent, raising total agricultural output in these countries by 2.5 to 4 percent, the report shows. This would reduce the number of hungry people in the world by around 12 to 17 percent. Improving the lives of women and girls worldwide is a tenet of the baptismal covenant, says Presiding Bishop Michael Curry in a written statement, based on General Convention resolutions and submitted to the commission. Episcopal delegates shape their advocacy from that statement and its priorities, sharing their own stories, reflections and concerns that further the cause. The church’s mission and work through rural congregations and networks, including many indigenous communities, are to “provide rural women and girls with spiritual care, socio-economic development, ministries to farmers, migrant workers and women, domestic poverty and asset-based community development programs and international development programs through Episcopal Relief & Development,” Curry wrote. Yet basic resources and services in rural areas can be difficult to access, costly, insufficient or nonexistent, Curry said. Those inadequate infrastructure systems harm almost every aspect of life, from access to water, sanitation, stable and nutritious food to quality medical care, education, social protection and family support services. and promote gender equality education and practices and eradicate gender-based violence. The 45 UNCSW member states, with input from accredited nongovernmental organizations including the Episcopal Church and Anglican Communion, plan to hash out a final draft of agreed conclusions by the end of the session or soon thereafter, Main said. The final agreement goes to the United Nations. If approved, the General Assembly expects member states to bring those priorities home to implement them in the following years. “It furthers the cause by taking action, and the member states are responsible for that. If you don’t have agreed conclusions, nothing can happen,” Rachel Chardon, administrative officer for the Anglican Communion’s Office at the United Nations General Program, told ENS. 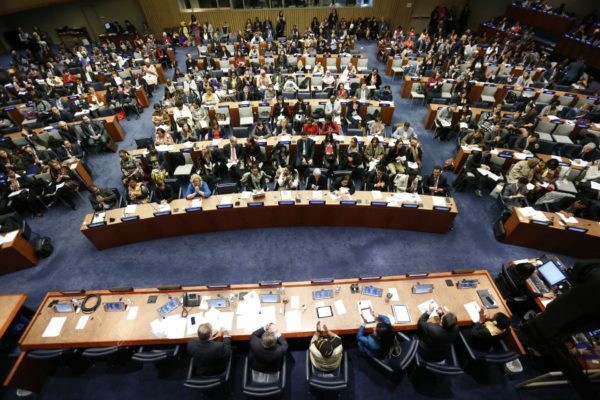 Since 2006, the commission has reviewed how the agreed-upon conclusions from some previous session were implemented, and this year, the commission is looking at the 47th UNCSW session to see how member states have implemented those priorities. The 17 Episcopal delegates, hailing from places such as Venezuela and Puerto Rico to Tennessee and Washington state, are diverse in age, culture, geography, race and experience. These delegates will be able to attend the official UNCSW proceedings at the United Nations, including joint advocacy with the group, Ecumenical Women. Other Episcopalians attend parallel events and UNCSW activities. One block from the United Nations, the Episcopal Church Center will hold several worship services and events throughout the two-week period for Episcopalians and others to attend and network. Episcopal churches will host events as well. Episcopal participation in this UN effort aligns with the “leave no one behind” and “reach the furthest behind first” principles of Agenda 2030 and the Sustainable Development Goals, which the church affirmed in 2016. Advocating for gender equality and empowerment was commended at the 2015 General Convention, and that includes transgender individuals, as well as women, Curry wrote in the statement. This work involves a lot of education. “This requires correcting present social, political and economic inequalities and identifying root causes such as traditional understandings of gender roles, socialization of women and girls to believe that they are ‘less than,’ passivity, religious beliefs, sexism, machismo and patriarchy,” he said.